Well, I’ve been a busy little bee over the past few weeks! 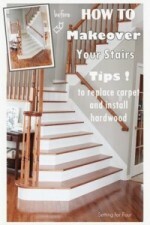 We’ve had our stair carpeting removed and hardwood lain and wow it looks so gorgeous! Pictures and post coming soon! After we tackled that little renovation we headed to our main floor bathroom and installed a new faucet! 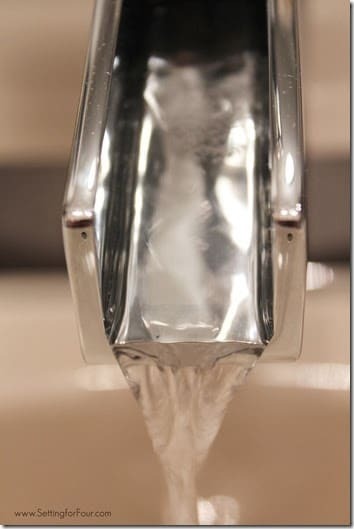 This is our old faucet…it leaked, it was really hard to keep clean, there were always fingerprints on the finish. What a difference a new tap makes! 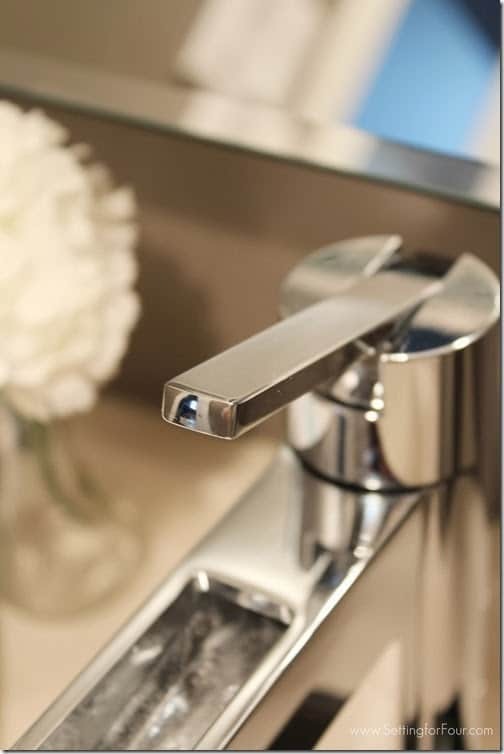 The Vega faucet is so easy to clean and just looks so stylish! I love the clean design and the unique ‘waterfall’ spout! It really does look like a waterfall! This feature is one of the main reason’s I chose this style…it delivers a gentle cascade and displays the natural beauty of flowing water! I love the center set single handle too – contemporary and so functional! Just lift up and turn right or left to use – so easy to clean too! 1. When decorating a bathroom with low lighting…use reflective finishes whenever you can! Reflective surfaces help bounce light around a room. Our main floor bathroom is not very big and with no windows it doesn’t get much light. 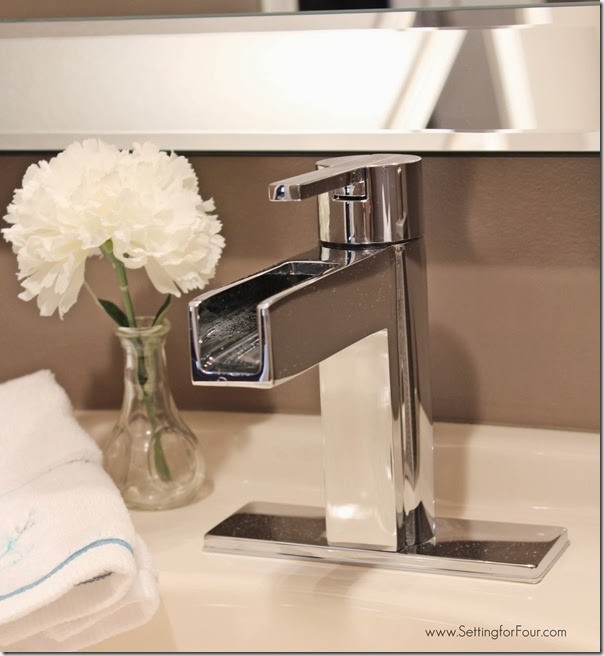 The chrome finish of this faucet really adds a gorgeous sparkle and lightens up the whole room. 2. Create a spa like environment: Add a vase of flowers. 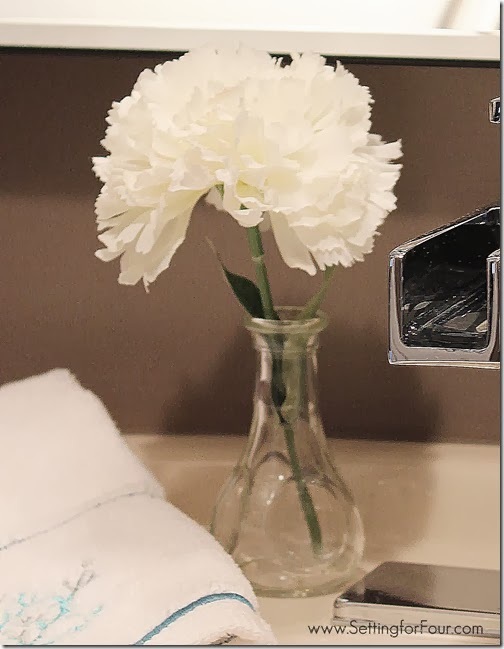 I added a simple white carnation in a bud vase to give my bathroom a spa-ah like feel. 3. Hang pretty decorative hand towels. They aren’t expensive but really add a touch of luxury to a bathroom! 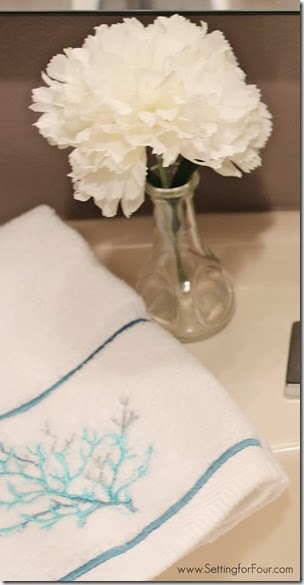 Here I added a small hand towel with a beautiful embroidered coral design to add a touch of coastal decor and pop of blue to my bathroom! I also added a glam silver faux ‘shagreen’ finish soap dispenser. The colors go so well with my bathroom walls and my new faucet! 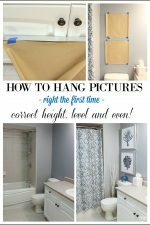 I hope you enjoyed my bathroom decor and update tips! 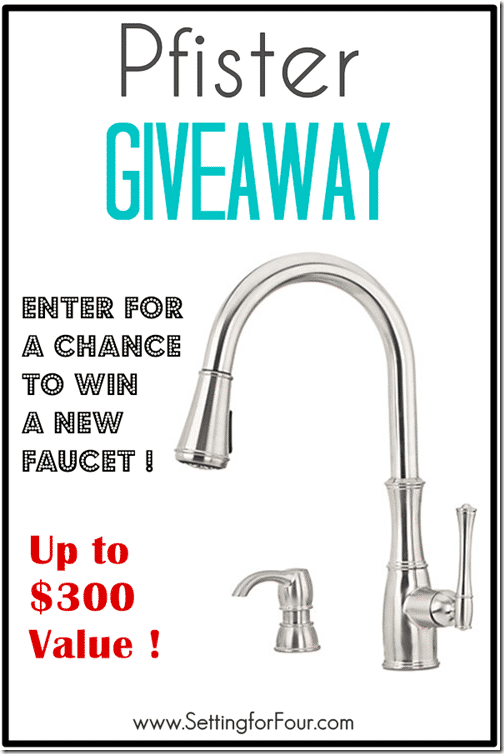 Update: Pfister faucet giveaway is over. 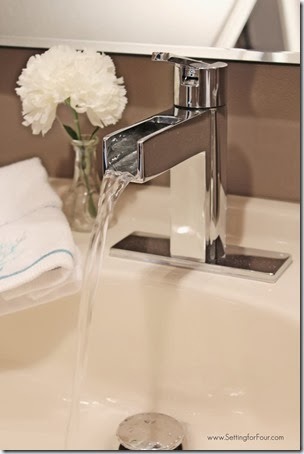 How To Pick A New Faucet & Faucet Design Ideas! We are building a new house..so I am not sure…but I LOVE the bathroom faucet you chose! So cute! Oh lucky you to be building a new house!!! Thanks for your comments and entering! Great tips! I need to purchase some new pretty towels soon…I think it will really help!! New towels are a great addition Meredith!! Either would be great! We are in need of both! 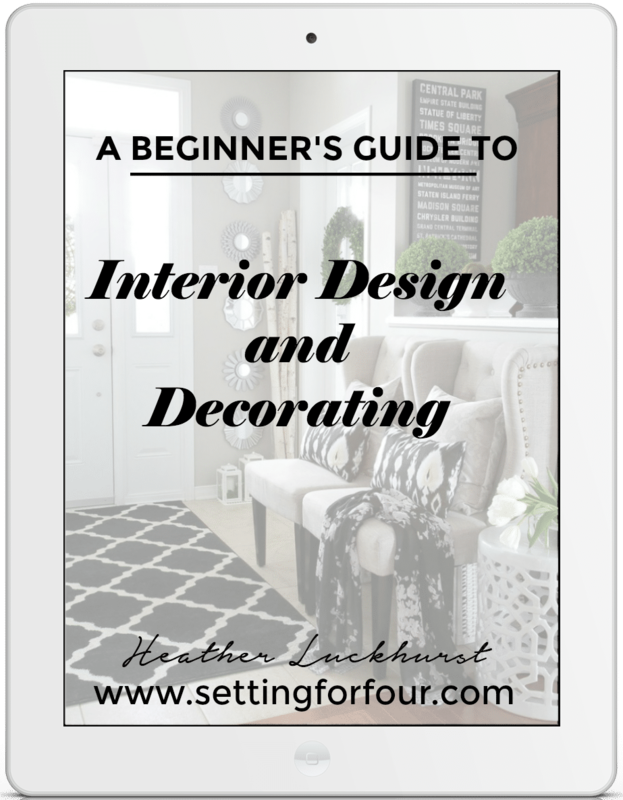 I am in the middle of putting together a design plan for our main bathroom–and we need EVERYTHING! That faucet choice is lovely! Kitchen! Ihave been doing for a new kitchen sink. If I win a faucet how can my husband say no to just buying the sink part?! I would chose a new kitchen faucet! Love that faucet! I have those exact towels myself! I picked them up in Marshalls awhile ago. I just added them to my new guest/craft room. thanks for the tips! I would choose a new bathroom faucet! My master bath needs a total upgrade. I absolutely love the faucet you chose, Heather. I need a new one for my kitchen and my downstairs bathroom…you have inspired me! This could be the start of our kitchen renovation!! I love your soap dispenser in your bathroom, though, which is leading me to think maybe guest bathroom reno! 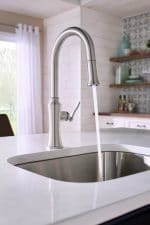 I would choose a new kitchen faucet – ours needs to be replaced! I love that waterfall faucet you chose though – it’s so pretty. We desparately need a new kitchen faucet! Side note: I loved the one you put in your bathroom! Gorgeous! That is one beautiful faucet. I love that waterfall faucet … it’s so unique! Ooo.. I love your faucet! 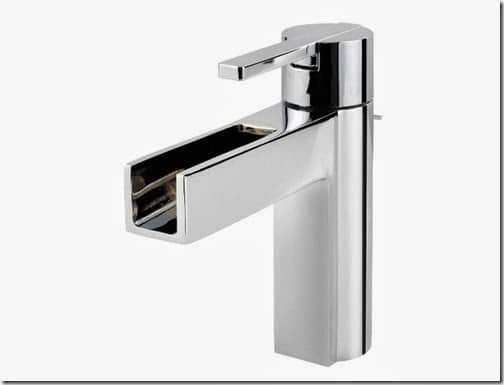 Kitchen – My faucet right now is leaking and I would LOVE to replace this with this modern nice one! Leaky faucets are the worst Jennifer! Good luck! 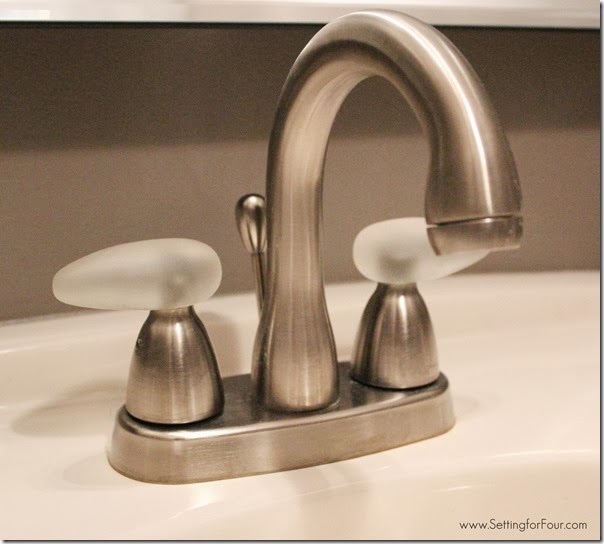 Kitchen – my faucet leaks and I really like this one! I so love and need this faucet! I am getting married in a few months so some updates would be awesome. I would love to win, I have a bathroom I will be redoing very soon! I would pick a new bathroom faucet! 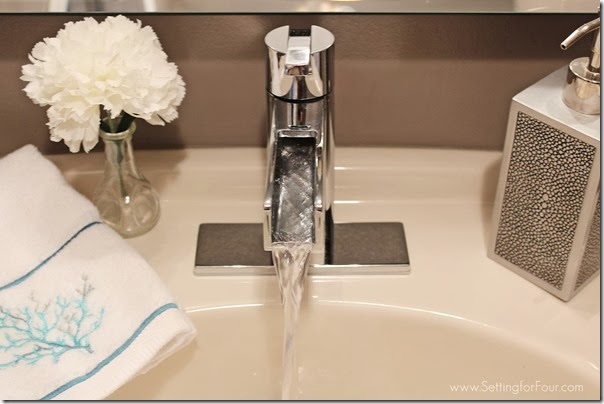 Love your new faucet, Heather – it’s SO gorgeous! I’d pick a kitchen faucet…. or maybe I might try to get that beautiful faucet you chose! I’m glad you like it Tara!! A new kitchen faucet would be fabulous!!! Wow, who knew a faucet could be so beautiful! I could finish a bathroom remodel with a new faucet!! Working on renovating a foreclosure for my first house…I’m exhausted. Any break I could get would be awesome!! Thanks Jen for your comments!! I am IN LOVE with that faucet, it must go in my home!!! Thanks for sharing! I would choose a new bathroom faucet. I am loving your waterfall one…gorgeous!! I am currently remodeling my bathroom so I could really use a new bathroom faucet! Gosh I don’t know if I could decide…I need them in both places. But I think I’d choose kitchen! 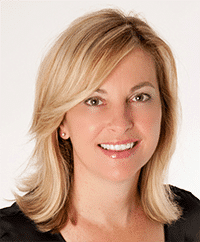 A new kitchen faucet would be a great way to kick off 2014 Jenny! 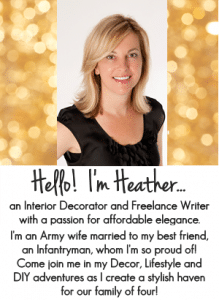 Heather – Thank you so much for featuring the Vega in your bathroom decor post. You did an excellent job with the design. We’re looking forward to giving a faucet away to one of your winners, too! that faucet matches my bathtub faucet!! my sink faucets needs to be replaced too, they have gold on them *gag* but id also love a new kitchen faucet since im about to start renovating that. Cool that it matches your bathtub faucet! Thanks for entering Alisha! Oh, they are all beautiful! My favorite would be the waterfall. 🙂 It’s absolutely gorgeous! Thanks Molly for your compliments! Pics of the new stairs will be coming soon! It always feels great to update or add some embellishment to our bathrooms. Thanks for sharing the giveaway. Pinned it! 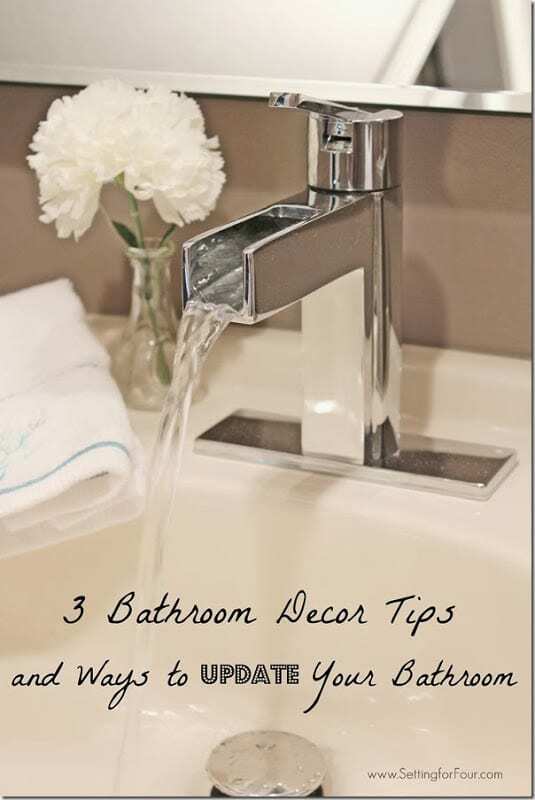 Great tips love the faucet!!! I need new bathroom taps. Badly. I would get a new bathroom faucet – it’s a toss up between sink or tub. I might have to replace each! Definitely a new kitchen faucet… we’re in desperate need for one! I am planning a bathroom remodel and really need a great faucet. Pfister is it! I would choose a kitchen faucet. We have been looking for a new one! Lovely faucet! Thanks for joining our Twirl and Take a Bow Party! Hope to see you again next week! That new faucet is beautiful! I love that style! Totally agree – the new tap is way more easy to stay clean. You gave me a great idea! Thanks. Would settle on kitchen faucet. I so need a new kitchen faucet. Mine has been broke for awhile now. 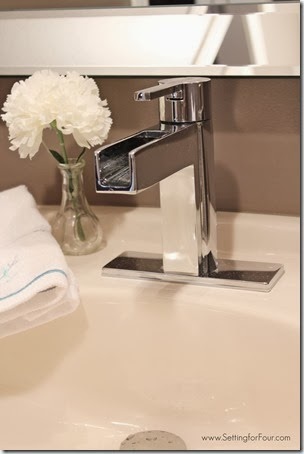 We have the Pfister Jaida faucet in our half bathroom and it’s so similar to that Vega. I’d def choose the kitchen one as we’re planning a future kitchen reno. What’s the name of the wall color? It’s beautiful! Thanks Dana! It’s Sherwin Williams ‘Mink’ – a gorgeous grey! Hi Dana! It’s Sherwin Williams Mink – gorgeous isn’t it? We love it!